Take Place 200 grams blanched chicken bones. Take 1 medium quartered onion and 1 medium roughly chopped carrot. Take 1 stalk chopped celery and 2-3 stalks chopped parsley. Take 1 chopped leek with leek leaves and 6-7 black peppercorns. Take 5-6 cloves and 1 bay leaf in a deep pan with 10 cups of water and heat. 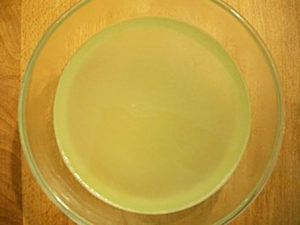 Now bring the mixture to a boil and remove any scum which comes on the top, and replace it with more cold water. 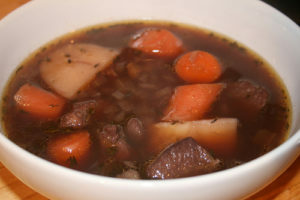 Simmer the stock for a minimum period of 1 hour. Remove from heat and strain, cool and store in a refrigerator till needed. Unutilised chicken carcass (neck, winglets bones etc.) can be used to make this stock. 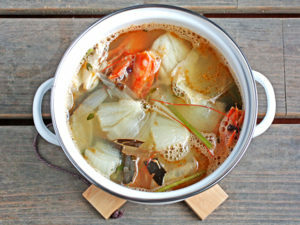 Place 200 grams fish bones, head, skin and any unutilised portions of fish, in a pan with 5 cups of water. Take 1 medium onion sliced and 1 large fresh button mushroom sliced. Take 2-3 inch stalk celery chopped fine. Take 1 bay leaf and 4-6 black peppercorns. Bring to a boil, remove any simmer for 15 minutes. Remove from heat and strain. Discard the solids and use immediately. If storing in a refrigerator, do so in an air-tight container so that the other items in the refrigerator do not get the fishy smell. Place 1 medium chopped onion, and 1/2 medium chopped the carrot. Take 2-3 inches celery stalk chopped and 2 crushed garlic cloves.Take 1 bay leaf and 5-6 black peppercorns. Take 2-3 cloves in a pan with cups 5 of water and bring it to a boil. Simmer for 15 minutes and strain. Cool and store in a refrigerator till further use. Wash and clean 200 grams of mutton bones and removing any excess fat. Boil in water to cover for 5 minutes. Drain and discard the liquid. 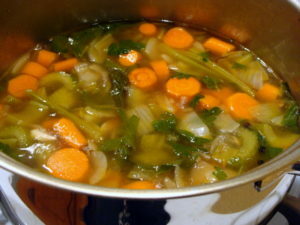 Boil blanched bones and 1 chopped onion plus 1 carrot cut into large pieces. Take 1 stalk of celery and 2-3 stalks of parsley.Now both cut into 2-3 inch pieces.Take 6-7 black peppercorns and 1 bay leaf in a deep pan with 10 cups of water. Simmer for at least 1 hour, removing any scum which rises to the top. Strain and use as required.